Recently, drought seems to be a fact of life. As the lead photograph poignantly illustrates, most of the U.S. has been struggling with serious levels of drought for the past several years. Worldwide, drought affected areas include Europe, India and Pakistan, Russia, much of Africa, South America – the list goes on. But when the rains start again, everyone expresses great relief, not realizing that long-term depletion of groundwater reserves is part of the price for surviving drought. It was with this in mind that GRACE (Gravity Recovery and Climate Experiment), a joint U.S. and German space project, was designed a decade ago. 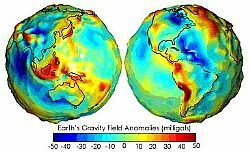 The GRACE mission consists of a pair of satellites designed to accurately map variations in the Earth's gravitational field. The two identical satellites are in a polar orbit some 500 km (310 miles) above the Earth, spaced a distance of 220 km (137 miles) apart along the same orbit. The distance between the satellites is continually measured using GPS and radar.